In 2 Nephi 17–20, Nephi recorded that Isaiah tried to persuade the king of Judah and his people to trust in the Lord rather than in worldly alliances. Using types and shadows—symbols or representations that teach and testify of great truths—Isaiah prophesied concerning events of his own day, the birth of Jesus Christ, and the destruction of the wicked at the Second Coming of the Lord. To help prepare you for today’s lesson, think of a time when you were faced with a fearful situation. Do you recall your first reaction? As you study 2 Nephi 17–18, try to identify Isaiah’s counsel to those who find themselves in a difficult or fearful situation. For your study of 2 Nephi 17–18, you will need to know about the three small nations of Syria, Israel, and Judah, as well as the much larger Assyrian Empire, which sought to conquer these smaller nations. Review the following map and the accompanying chart. Read 2 Nephi 17:1–2, and refer to the map. “Syria is confederate with Ephraim” means that these two countries formed an alliance or agreement. Try to determine who was attacking whom. Be aware that the phrase “house of David” in verse 2 refers to Ahaz and the people of Judah. The kingdoms of Israel and Syria wanted to conquer the kingdom of Judah and force Judah to enter into an alliance with them against the powerful Assyrian Empire. Assyria was threatening to conquer an entire region of the world at that time. Israel and Syria believed that by conquering Judah, they could have more people and more resources to fight the approaching Assyrians (see 2 Nephi 17:5–6). King Ahaz contemplated making this alliance with Israel and Syria. Consider what you would do if you were King Ahaz. On one side, Assyria is threatening to attack your people. On the other side, Syria and Israel are threatening to attack if you do not join an alliance with them to fight against Assyria. Isaiah lived in the kingdom of Judah, and the Lord sent him to Ahaz with a message. How do you think you would feel about a message from the prophet if you were King Ahaz? Read 2 Nephi 17:3–8, and underline the Lord’s message to Ahaz and his people, as given through the prophet Isaiah. (The term “smoking firebrands” in verse 4 refers to a torch whose flame has burned out, symbolic of these two kingdoms being broken and conquered.) Imagine you heard Isaiah say this to Ahaz. Later, a friend asks you what Isaiah said. Write two or three sentences in your scripture study journal describing how you would answer your friend. Isaiah tried to help the king and his people rely on the Lord for help, rather than trusting in unstable political alliances. Why is it important for us to turn to the Lord when we need help rather than relying only on other people to help us? What are some ways in which young people may be tempted to put their relationships with other people before their relationship with Heavenly Father and Jesus Christ? The Lord said he would give Ahaz and the kingdom of Judah a sign that He would protect them and that they would not need to rely on worldly alliances. Read 2 Nephi 17:14 to determine the sign. Circle the word Immanuel in this verse. Next to this verse write “Matthew 1:22–23.” Read Matthew 1:22–23 to discover the meaning of the title Immanuel. How would a sign that meant “God with us” help Ahaz at this time? How could such a prophecy by Isaiah also have reference to the birth of Jesus Christ centuries later? 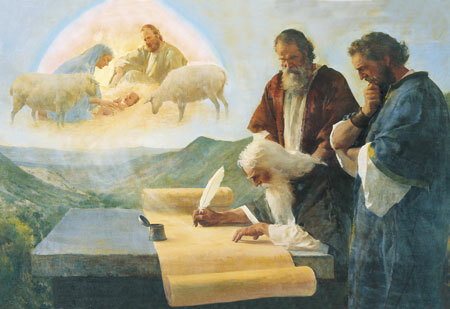 For further understanding of the sign of a child being born, contemplate the following explanation by Elder Jeffrey R. Holland of the Quorum of the Twelve Apostles: “There are plural or parallel elements to this prophecy, as with so much of Isaiah’s writing. The most immediate meaning was probably focused on Isaiah’s wife, a pure and good woman who brought forth a son about this time [see 2 Nephi 18:3], the child becoming a type and a shadow of the greater, later fulfillment of the prophecy that would be realized in the birth of Jesus Christ” (Christ and the New Covenant , 79). Isaiah prophesied that before the child was grown, Assyria would conquer the armies of both Israel (Ephraim) and Syria (see 2 Nephi 17:15–25). The sign meaning “God with us” was intended to reassure King Ahaz that God will be with us when we trust in Him, even during times of difficulty and fear. Consider writing this principle in your scriptures. Read 2 Nephi 18:6–8, and underline the phrase “waters of Shiloah.” The waters of Shiloah symbolized for Isaiah the calming, steady, sustaining influence and power of God that needed to be part of the nation’s political life (see 2 Nephi 18:6). Isaiah used the reference to the waters of Shiloah as a contrast because the people of Israel and the people of Judah rejected the Messiah—“the waters of Shiloah,” or the calm, soft, steady, sustaining power of God. Therefore, as Isaiah prophesied, the king of Assyria and the horrible influence and torrential power of his invading army—represented by “the waters of the river, strong and many”— conquered Syria and Israel. Read 2 Nephi 18:9–12, and notice how many times the Lord counseled Judah not to join with Syria and Israel. As recorded in 2 Nephi 18:13, where did the Lord, through Isaiah, counsel Judah to go for help instead? By the time the Assyrians had overrun Judah and were threatening Jerusalem, the kingdom of Judah had a new king. His name was Hezekiah. He trusted in the Lord and the prophet Isaiah. Eventually 185,000 Assyrian soldiers were slain in their camp by an angel of the Lord (see 2 Kings 19:35; Isaiah 37:36). When have you turned to the Lord for strength when you were initially tempted to turn to other sources? What did you learn from the experience? Under King Hezekiah, the people of Judah were spared from destruction because they followed Isaiah’s counsel from the Lord. How can following modern prophets guard you against spiritual harm? Have you ever gone for a long time without seeing the sun or feeling its warmth? If you have not, imagine that you had a constant shadow on you, with no access to the light and warmth of the sun (like being in a dark room all the time). Isaiah used a similar image to illustrate the spiritual condition of people who live without the light of Jesus Christ. There are two lands mentioned in 2 Nephi 19:1–2. Read these verses, and mark the names of the two lands. Over the centuries prior to the time Isaiah wrote these verses, multiple wars had been fought in an attempt to control the area now known as the Holy Land. Some referred to this area as “the land of the shadow of death” because so many had lost their lives there in battle. During New Testament times, Nazareth, Capernaum, Nain, and Cana were located in the regions formally known as the lands of Zebulun and Naphtali. These are cities where Jesus Christ spent much of His time, ministering to the people more than 500 years later. It is known today as the Galilee area. Mark in 2 Nephi 19:2 what Isaiah said the people of this region would eventually see. Read 2 Nephi 19:6–7, and contemplate which of the Savior’s titles in verse 6 might have been especially meaningful to the people of Judah, given their circumstances. In your scripture study journal, write how one or more of these titles describes how you feel about the Savior. Isaiah’s prophecy of the destruction of Assyria, recorded in 2 Nephi 20, is also a prophecy of the destruction of the wicked at the Second Coming. As you read this chapter, remember that just as Hezekiah trusted in Isaiah’s counsel from the Lord and was blessed, if you place your confidence in the Lord, you need not fear the judgments that will come upon the inhabitants of the earth in the time leading up the Second Coming. How does the sentence in the study exercise above describe how the Lord responds to nations, families, or individuals who reject Him? How can you apply the following truths in your life? Jesus Christ is a God of judgment and mercy. His mercy is extended to those who repent and keep His commandments. In your scripture study journal, write about a time when you were obedient to a certain commandment and felt God’s mercy. I have studied 2 Nephi 17–20 and completed this lesson on (date).